JUST ABOUT EVERYTHING AMERICANS DO TO CARE FOR THEIR LAWNS ULTIMATELY HARMS THEIR LAWNS. DOES THAT MAKE ANY SENSE? In these files we cover just about everything you need to know to have a beautiful low maintenance lawn, AND MUCH OF IT WILL BE DIFFERENT FROM WHAT YOU ARE DOING NOW.. We divide the files into those tasks common to most lawn programs and those tasks devoted to fixing a lawn that doesn't look as good as you would like. The problems you may encounter in your lawn are covered in the solving problems section of Yardener's Helper. We define a perfect lawn as one that is green all year long, needs fertilizing twice a year in fall and again in spring, hardly ever needs watering except during drought, has no weeds, no insects, and no disease, takes minimum time to maintain, and looks better than any other lawn in the neighborhood. Sound like a fantasy? Not at all. Such a lawn can be had if you follow the advice in this section of Yardener's Helper. 1. Raise the lawnmower height to 2 1/2 inches in the spring and fall and 3 inches in the summer. Click here for info on mowing properly. 2. Overseed the lawn once or twice this year, and then every three to four years thereafter. Click here for info on overseeding. 3. Add organic material to the soil under the turf by mulching at least once a year from now on. 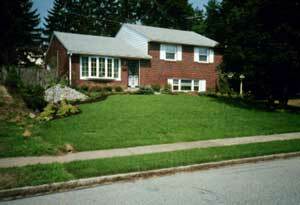 Click here to get info on mulching the lawn. 4. Use only slow release nitrogen fertilizer on the lawn; never the quick release nitrogen fertilizers. Of course there are other techniques and tips throughout this section that can help you have a better lawn while taking the least amount of time to care for it. Check it out.